Starting January 1, 2014, family planning services and supplies will be available free of charge through Indonesia’s universal health coverage system, and efforts are underway to improve 23,500 clinics and strengthen human resources in order to meet increased demand. Resources are being reallocated to focus on the most densely populated areas, and efforts will be concentrated on reaching populations in rural areas and on smaller islands. The government is committed to working with national and international partners to provide the technical support needed to provide gender-sensitive, high-quality family planning infor-mation and services to all people, including unmarried women, youth, and the poor. Indonesia’s Family Planning Summit and Commemoration of World Contraception Day, held on September 26, 2013, in Jakarta, was a resounding success. More than 1,700 participants were in attendance. The Vice President of Indonesia, Dr. Boediono, opened the meeting by reiterating the government’s strong commitment to family planning and by personally pledging his full support. Five government ministers presidedover the opening and high-level panel discussions. Dr. Julianto Witjaksono, Deputy of Family Planning and Reproductive Health of Indonesia’s National Population and Family Planning Board (BKKBN), serves on the FP2020 Reference Group. BKKBN’s Dr. Siti Fathonah serves on FP2020’s CE WG, and Dr. Roy Tjiong of the Indonesian Planned Parenthood Association serves on PMA WG. All three played an active role in designing and executing the Indonesia summit. Historically, Indonesia had one of the world’s most successful family planning programs. However, progress has decelerated over the last decade, and the contraceptive choices available for women have diminished. Today, fewer women are using IUDs and implants than 15 years ago. 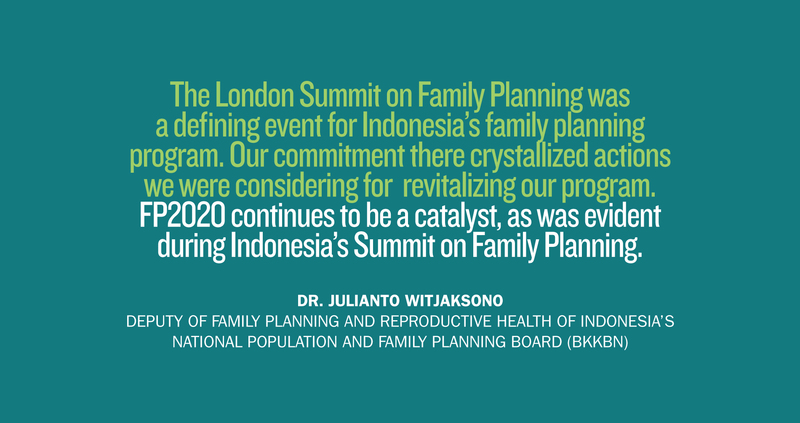 Responding to this stagnation, Indonesia committed to improving the quality of its family planning program at the London Summit on Family Planning. Responding to this commitment, BKKBN convened four FP2020 country meetings. The meetings, which were co-chaired by USAID and UNFPA, had a catalytic impact on the reproductive health community and reframed and reinforced the government’s revitalization efforts. BKKBN’s new chair, Dr. Fasli Jalal, told the Indonesia Family PlanningSummit attendees that family planning must be prioritized as a long-term, multisector development issue. To do so, it is essential to build support in the local governments of more than 500 districts. Some significant actions discussed during the summit include increasing access to long-acting methods of contraception, improving and increasing midwifery services, and mounting a communications campaign to raise awareness of family planning choices. One highlight of the summit was a panel of young people who discussed the needs of youth in Indonesia and challenged the government to increase the legal age for marriage from 16 to 18 years old. They asked for more attention and resources for sexuality education and greater support for young people, especially the poor and most vulnerable. The Minister of Health, Dr. Nafsiah Mboi, spoke of the critical importance of family planning in reducing maternal and infant mortality, and underlined the need to collaborate across government programs to support the needs of women and girls. Attendees applauded midwives for their heroic efforts to improve maternal health and for the pivotal roles they play in improving access to family planning and expanding contraceptive options. Another high point was the announcement that BKKBN and the Population Commission of the Philippines had signed a memorandum of understanding to support south-to-south collaboration, with a focus on Mindanao Island, a conflict area in the Philippines that has a majority-Muslim population. Areas of collaboration include strengthening the role of faith-based organizations, sharing lessons on decentralization and local advocacy, and sharing best practices.